A doctor who fled the UK after allegedly stealing £400,000 from the NHS shot his partner dead then killed himself, an inquest has heard. 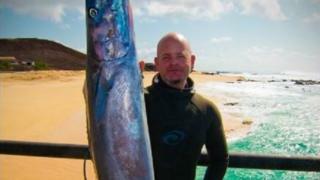 The bodies of Titus Bradley and Noemi Gergely were found at a guest house in Cape Verde in April. Dorset assistant coroner Richard Middleton ruled the death of Mr Bradley, a GP in Dorset and East Sussex, as suicide. Sussex Police has closed its probe into the alleged theft from his practice. Dr Bradley, originally from Llanelli in Carmarthenshire, left Hastings in 2017 shortly before it was discovered cash was missing from the accounts of four GP practices he ran in the town. The following year, staff at the Divin' Art guest house in Santo Antao found the bodies of the doctor and his Hungarian girlfriend, as well as a handgun, in their room. Both had bullet wounds to the head and police concluded the 42-year-old GP had shot Miss Gergely, 28, before shooting himself. Mr Middleton read out a statement from Dr Bradley's mother, Gail Seery. According to the Dorset Echo, she said her son had been a "high achiever" but had suffered from depression and suicidal thoughts. Sussex Police launched an investigation into the theft of NHS funds after being contacted about "the possible inappropriate use of funds at the Cornwallis Plaza surgery". "The matter has been fully investigated, but as there is no living person to charge with an offence, it has been filed as undetected," the force said.